Tales from a summer camp...: Pritzus, I know it when I see it! Our Camp Sdei Chemed Girls at Meorat Hamachpeila. I wrote this a little while back, and decided to keep it for my own sad amusement. But a recent scenario threw me over the edge and motivated me to to publish this. I posted a photo on my website of some campers of mine and evidently one girl had her sleeves rolled up above her elbows. One commentator had nothing better to do then to point out this incredible breach of tznius. If this was isolated I would just ignore it. But it isn't. 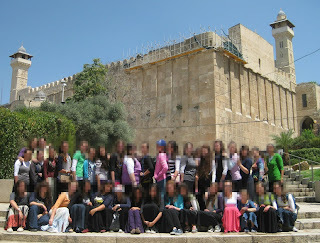 I get calls many times from Bais Yaakov teachers pointing out that they saw too much skin on a campers photo. Seriously, where did we go wrong? When have we become so obsessed with chitzonius. We tell our girls its the inside that counts but all we do is judge them by how many inches they cover. We should be praising these girls for wearing long sleeves in over 100 degree weather! I wrote this in response to a community letter that was printed in a Flatbush newspaper. I'm told letters like this are quite common. But instead of printing the original letter I will just underline the quotes I took from it. I would like to personally thank you for bringing the issue of tznius to the public. Since I read your letter, it has opened my eyes to a problem that is surely bigger and more severe than anything else facing our community. I myself have grown up very naive about tznius. It wasn't discussed much at all in my home, my father who wrote articles on every topic never seemed to address the crucial issue of tznius. I went to a yeshiva that not only didn't talk about tznius, they never mentioned the existence of girls in general! Even in my Choson classes I dont remember being taught what and what not my wife can wear. I was told you’ll know it when you see it. After getting married, I took for granted that my wife, who I admired and respected, grew up in a frum home where she was taught how a bas melech should dress. I seemed to have been proven right because I don't remember ever discussing tznius with her except when she asked me if a dress that she bought looked tzniusdik. I myself wasn't sure what to answer, and even more I wasn't sure what the right answers was. Did she want to know if she looked attractive in it or was she looking for a psak halacha. Either way I wouldn't win so I just told her it seems fine and she should use her best judgement. It wasn't until we decided to open a girls’ camp that I began asking rabbonim about the standards of tznius, this way we could set our camp rules according to proper halacha. Any questions about tznius issues though, was my wife’s department. I would never tell a girl if I thought something she was wearing was inappropriate, for that matter I never commented on anything a girl was wearing. I would just feel uncomfortable doing so and I thought she would too. Throughout my 35 years living in Brooklyn, visiting many diverse Jewish neighborhoods, and my 7 years involved in an all girls’ camp, I never paid much attention to the issue of Tznius. It’s not like I never noticed an improperly dressed girl, I just never paid that much attention to the massive problem at hand. Maybe it was because of the non-jewish world that I was unfortunately exposed to and from all the pritzus I saw around me, be it the magazines, billboards, and TV. And so I have desensitised myself to what tznius is all about. But yet somehow I was always able to tell a modestly dressed girl without a second glance, no matter her dress code. But now after reading what you wrote and how all the terrible things that happen today are because of our lack in tznius, I see everything in a new light. I started paying much closer attention to the same woman I have seen in the past. I now notice the length of her skirt before I even say hello. I can tell you how many inches below or above her knee is covered within seconds, and just like you I'm appalled. This isn’t just when they stand, but as you pointed out that when they sit down it gets even worse. I notice that some women who wear snoods don’t cover their hair completely, I have found a range of about 1 - 3 inches and even one woman that was nearly 4 inches! And while I was sure everyone in our community covered their hair with a shaitel, I have learned the skill to tell whether a woman is really wearing a shatel or not and I'm very disappointed that there are still many who don't (unless I’m still not that good at this yet). Rabbi X, you have opened my eyes to a subculture I never new existed amongst our frum community, a community that I was once very proud to be amongst. I guess until I read your insightful letter I never looked at the extreme details of every woman I met, and I guess I just saw them more as a person and not a dress code. I was judging them favorably, something I was taught to do. If I just knew the tumah they were projecting on to the community, I would have been much more judgmental. You have B”H changed the way I look at women and girls and it is very different than the way I was brought up. And so now I understand your concern why you felt this issue of tznius is what is holding back moshiach. I would also like to add, that just like you, I also noticed this past purim these girls hanging out like zonas on the street corners talking to guys. And while in the past I felt it wasn't so much their fault as there was no other program for the girls on purim night except to watch the guys getting drunk and having a blast, now I feel just like you, that girls should be kept in their rooms, saying tehillim or school work, as you explained so well “A Jewish woman belongs in the house.” Purim is just not a yom tov for them! We need to install more Vaad Hatznius, like in Eretz Yisroel to patrol our neighborhoods. Eggs, bleach, whatever it takes to get rid of these immodest girls. We could even hire professional spatters at every corner, it seemed to have had a very positive effect in Beit Shemesh. The Rambam that you quote goes on to say that if a community is not living according to halacha and there is a lack of tznius one is required to leave immediately, even to a remote island to live all by himself. I believe this community is not adhering to the tznius guidelines you set forth and there is pritzus all around I think it would be best for you to leave. Please note: For those who don't get the point of this letter. I believe, we as men, need to stop putting out these ridiculous tznius letters, they are making us all look like a bunch of perverts. We need to educate tznius on a more personal level and it shouldn't be all about rules and inches. P.S. I found this post online and verified this behavior with others that attended this school. It is from a forum call ImaMother where for the most part the information is very reliable. I went there as a child. This was over 13 years ago, so anything I say could have changed. First the positives- they for sure gave a scholarship to my family. I never felt bad about coming from a poor family. There are no pretensions in that school. And overall, send a message of good middos. A lot of the people who go there come from wonderful families and are very very sweet. On the other hand- my brother went to the boys' school for a while- he got beat up and hit with a belt and he wasn't the only one. They didn't hit in the girls school. But. So many things. In eighth grade, for example, the principal lifted my skirt up above my knees because she suspected I was wearing socks. She was right; I was. So she gave me a pair of size small tights to change into, even though I was tall and big. I told her they didn't fit; she told me my socks don't 'befit'. Never mind the fact that she would never have known they were socks if she hadn't picked up my skirt. I was once whistling, same principal screamed at me out loud in the hallway for probably what was over 10 minutes, about what a 'shiksa' I was for whistling. SCREAMING. Apparently only bums whistle. My entire grade could hear her screaming from inside their classrooms. That's only the beginning, but I think you get the drift. And their teachers. Some of them are wonderful and kind. Most of them probably were. Education was another story. Some had it; some didn't. In second grade (I still remember this), my teacher said, "Isn't paper spelled p-a-p-p-e-r?" I corrected her. Luckily, she knew her own limitations and took my word for it. In eighth grade, our teacher started teaching us about President Buchanan. She pronounced him "Buch (rhyme with ugh)-anan." The class corrected her too. 13 years ago, when girls had hashkafa questions, the teachers couldn't answer. I don't know what the story is today, but that was (just a tidbit) of my experience. Even though letzanus (joking around) and levity are usually frowned upon, when used for the right purpose, they are considered great mitzvos. " Why, just walking down the street in Manhattan, he could tell instantly that the women walking in front of him had skirts that barely covered their knees, blouses and skirts that were too tight, and no stockings. All while averting his gaze! Now there's a man who knows how to look a woman up and down with barely a glance, and quickly determine how alluring her clothing is. Maybe you could contact this holy man and set up a hilchos tznius chavrusa? CSL. (cant stop laughing). I'm sure these are the things that R' Moshe and R' Yaakov thought about as they walked down the street. It's sickening. Teenagers talk this way, not grown men. I remember my father once got a letter from a lakewood boy who just started dating and he was appalled at the standards of tznius in manhatten. He wanted my father to ban having bochurim date in the city. I wish I had a copy to post. Of course! That's why you need a billboard on the BQE warning you to avert your eyes as you drive into Manhattan. In some yeshivos the (male) hanhala checks out the women who come to pick up their children from school and admonish them (the male rabbis admonish the women) for tznius violations. It is beyond me why they are checking these women out in the first place. I disagree that there is a "serious tzniyus issue in our community". With very little personal experience in the matter, how would you suggest educating the girls about tzniyus in a way that brings both the "rules" (inches) and the appropriate message about tzniyus across? I was discussing this with my wife the other day, after reading your previous post on the BY Lakewood story. Perhaps I can suggest that tzniyus be translated as "dignity" rather than "modesty"? A subtle but critical difference that emphases empowerment over inhibition, and brings home the message that its all about who you are, vs. how long your skirt is (leaving aside for the moment that the accepted definitions of 'erva' are not that clearly defined in regards to dress; as the reason given for wearing elbow-length sleeves, for example, is so that if the woman is working with her arms, a passerby should not see up her sleeve to her chest. So does this mean that the forearms become erva by rabbinic decree, or simply a chumra that everyone treats as halacha?) (I'm very vague on the source, but I clearly remember learning it at some point. I think it was a gemara somewhere, but it could also have been Mishna Berurah. If someone can point it out for me, I would appreciate it). My own education on tzniyus in high school was sorely lacking, as it is in many boys yeshivos. The closest we came was an occasional shiur on a tshuva of RMF, z"l about whether it was permissible to have a shomer-negiah girlfriend ("no") and the annual pre-pesach Boardwalk Shmuess - "don't hang out in hotels over pesach, and if your going to a hotel, then STAY AWAY FROM THE BOARDWALK because 'its bad for you!' " (I grew up in Miami). I also had a rebbe who made inappropriate remarks for the admirable goal of encouraging 12th grade boys to avoid hanging out with girls, but in retrospect, years later I think the way he said it came out to be both disrespectful and somewhat objectifying. In a nutshell, its not just the girls tzniyus education that needs to be addressed. It's also the boys. I think you completely misunderstood Dovid's post. Read it again, this time understanding that he was using sarcasm to say that our community has overdone our concern with tznius to the point that we have actually created a bigger problem. And the problem is both for the girls who, if they had been given gentle and dignified guidance and less "catching and punishing infractions" would mostly be happier, more tzinusdik - inside and out, and they would keep that feeling long after they graduate when nobody can force them to follow the standards. And it's also created a problem for the males who now have been taught all sorts of places to notice and think about that they never would have imagined had our new zealots not obsessed over this and brought it to their attention. I understood it that way, perhaps I could have written my original comment a little clearer. Tzniyus EDUCATION is the issue, as too many places are all about the "rules" and less about the spirit of tzniyus. However, there are rules - or at least guidelines - for dressing in a tzniyus fashion, regardless of anyones feelings on the matter, the rules are there for a reason: To protect the dignity of a bas yisroel, and to prevent hirhurim - innapropriate thoughts - from inadvertent glances of passerby. I agree 100% that the fire-and-brimstone approach to tzniyus education is wrong and counterproductive, and therefore, the rules do NEED to be given, just in a different manner. My question is how would R' Teitelbaum suggest teaching tzniyus while maintaining the standards, especially in a school where many of the girls don't have the same role models at home that I did? It's more than just modeling, and yes, I think micro-managing tzniyus is also counterproductive. Just as you can't teach hilchos shabbos only in a 'feel good' 'Hashem loves us so lets rest on shabbos' manner - you need to understand the rules, and the halachic basis for those rules; you need to teach the rules as well as the spirit of tzniyus. Again, my question is "How?" I think it's a question of how you teach halacha in general. The halachos that stick with me from my years of education are very often the ones that I learned "inside", i.e. through delving into the primary and secondary sources, even if it meant learning three or four different opinions about how we pasken. The little mussar shmoozes and fire and brimstone stories were quickly disdained and forgotten. No, I can't quote you mar'ay mekomos now for skirt length and sleeve length but at one time I could, and the fact that there is a codification of the rules which can be studied has always been a steadying factor for me. I can also say that most of what I keep today regarding tznius (30 years after my time in seminary) I learned in maybe a week's worth of studying. My upbringing was fairly Modern Orthodox. I don't know how common the textual approach to teaching halacha to girls is among the Haredi world. I know if I'd only learned about Tznius - or any halacha - from these little fairy tales I would probably be keeping none of it today. There are several books today written for teens about tznius. I don't know if they are any good, but I know some of them are designed to teach in a non-threatening and positive way. They weren't around when I was a kid. I was a bit overwhelmed when I went shopping for a bat-mitzvah gift and found such a huge selection of tznius books for preteen girls but hardly any on any other topic. I chose not to buy one for the young lady, because I figured she was getting enough of that message in her right wing school. Should men learn these halachos? My first reaction is to say no, not unless they are going to into rabbinical positions where they will be asked to pasken for their congregants. The men should be concerned with their own obligation to control their eyes and their thoughts. But maybe with all the irrational intolerance going on, it would be good if they understood that chazal never talked about tights and certainly not denier count. My suggestion is to ask the previous generation how it was taught. I bet it was without all of the specifics. These books didn't exist at that time and yet somehow a dor of tzniusdik mothers came about. We should have a discussion about the tznenus of shietels. I feel in general, that there is little to no tznenus associated with their being worn, especially those that are extra long and those that drape seductively over the eyes. My wife also told me that some women look like zonas! The problem is most prevelant with women who consider themselves the "most yeshevish"
Letzanus is the opposite of Torah. The Mesilas Yeshorim says a small amount of letzanus can override 100 proofs. @SamFl Why do you have so much hate in you, I dont get it. Its a pretty simple concept you are allowed to make fun of stupidities and that is the point of this letter. I cant really answer that question because I'm not a girl and i think only a girl can explain what works and what doesn't. But my wife said this girl makes some very good point about it. it was taught by example. You seem to not understand that Rabbi Teitelbaum's letter was sarcastic. You also seem to have a problem with women looking attractive. There are no halachos associated with sheitl hair draping in your eyes, other than v'nishmartem l'nafshoteichem -- if you can't see where you are going, you may hurt yourself! There are some Jewish communities that feel sheitls are not tzniusdik at all, e.g. some Sephardim and certain Chassidim. You are free to go live amongst them. If you desire to stay where you are, may I suggest that you keep your eyes on your own wife, and tell her that she looks lovely. And stop thinking that other men's wives are out to seduce you. Thanks for responding. I would have said the same. Just to add, Reb Moshe gave the Heter on Sheitals and we need to respect his Psak. The signs that go up in E"Y that if you wear a sheital you will got to hell is wrong. That being said, I don't like them and I rather my wife wear a head scarf, but where she would stand out it wouldn't make sense. On re-thinking the issue, I would say there are a lot of grey areas outside of halacha where people disagree about the "spirit of tznius", or have different traditions in their communities. While I respect that some people have different sensitivities than I, I think it's important to not be judgmental. People are too quick to brandish the words "prutzah" or "zonah" for anyone whose standards are different than their own. If it bothers you, don't look. If it's all around you, maybe you're in the wrong community. But don't issue bans against things that were never halacha. Frum guy from quince, I'm sure there are some people who would declare that your own wife isn't tzniusdik enough. We are not disagreeing with you. Someone who was never taught the concept of tznius will never get it. But that is their issue and not ours. Its a result of the way tznius is taught, we cant do much about it now other than look away. Well, I am disagreeing. And I don't see how I've misinterpreted anything. I left out many things that girls tell me about what the male principals tell them. All I could say is if it took place in a work place you might be a able to sue for sexual harassment.